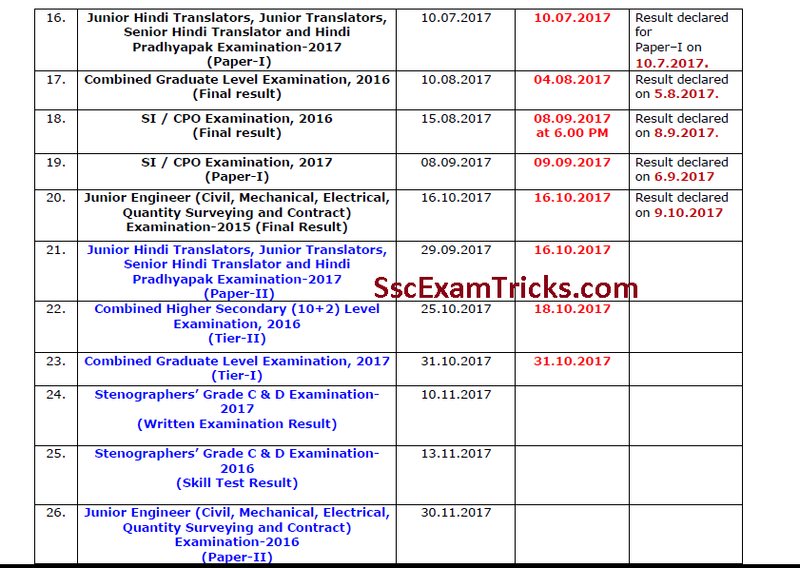 SSC CHSL Paper II Result 2016-17 Scorecard Released – Download SSC LDC Result 2015-16 (10+2 Level) PA SA LDC Final Merit List Scorecard / Marks List Cut off Marks – Check SSC CHSL Skill Test / Typing Test Call Letters Final Result Appointment Joining Latest Updates on ssc.nic.in. It was expected to be declared on 18th October 2017, suddenly SSC has decided to declare the prepared result on 13th October 2017 on official website www.ssc.nic.in. 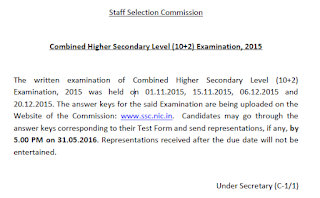 The list of qualified candidates called for SSC CHSL Typing test has been published category wise. 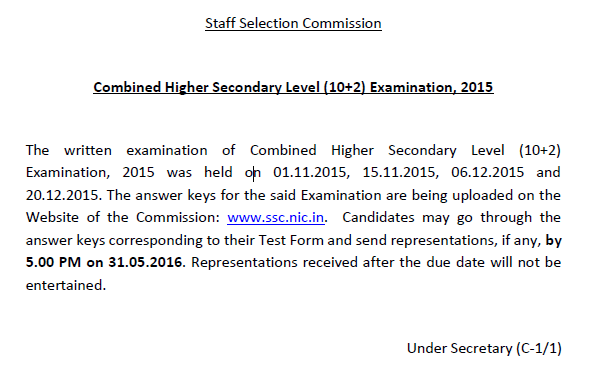 The news is that SSC has revised the result date for declaration of LDC/ CHSL (10+2) based examination. Earlier SSC CHSL Tier II Result will be declared on 25th October 2017, but Staff Selection Commission has changed the plan and now it is going to be declared on 18th October 2017 on www.ssc.nic.in. The notice for Change in the result date of SSC LDC Paper II Exam 2017 has been uploaded. 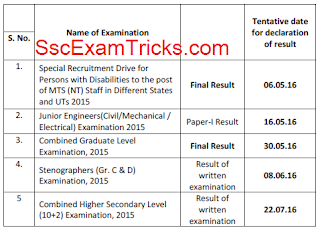 Download Notice for New Result Date of SSC CHSL Paper II. Latest Updates (24.04.2017): The result will be available very shortly at www.ssc.nic.in. 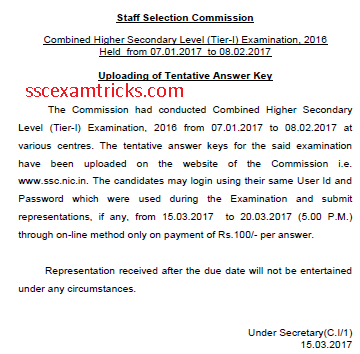 Latest News (25.03.2017): The tentative answer keys for Tier I examination has been uploaded now on website www.ssc.nic.in. The tier I exam was conducted from 07th Jan to 08th February 2017 at various exam centres. These answer keys can be downloaded with a payment of Rs.100/- from 15th-20th March 2017. 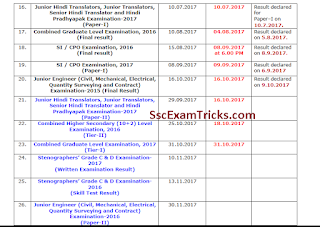 SSC CHSL Result The exclusive updates is that based on the result declared on 29th July 2016, SSC has revealed that 5792 candidates had appeared in twice in the examination held previously. The commission decided to cancel their candidates including 334 candidates who had qualified in the exam. This has happened because these candidates have violated the terms and conditions of the advertisement. The list of such candidates is annexed with the notice available here. The special would be taken to conduct SSC CHSL Tier II which is descriptive test by taking an undertaking from the candidates that they have appeared in the examination only once. The descriptive test exam date has been announced. SSC CHSL Result 2015-16 Declared (30.07.2016): The biggest news is that SSC CHSL result 2015-16 has been announced on 30th July 2016. The SSC result declaration was held at www.ssc.nic.in. 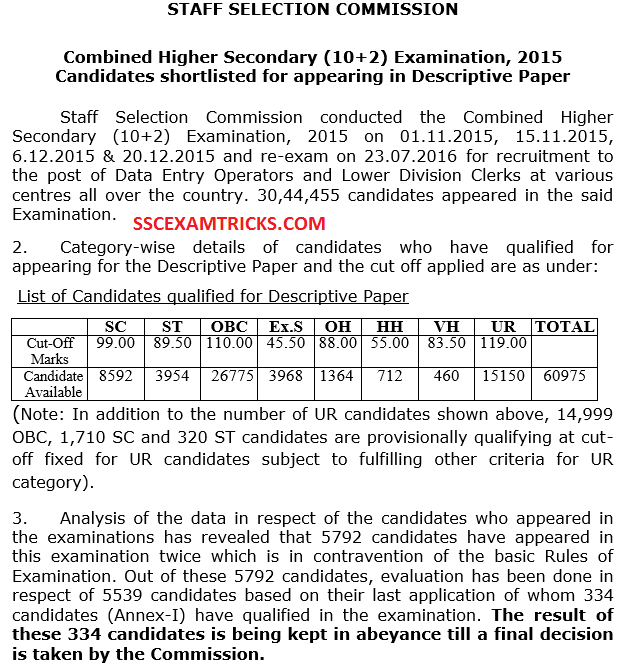 The roll numbers wise list of shortlisted candidates for descriptive examination has been declared by the commission on website. These candidates have been qualified from written exam (objective test) held on 01st 15th, 22nd Nov & 6th, 20th December 2015 at many exam centres. The SSC LDC Result, Scorecard/ Marks will be uploaded on 08th – 09th August 2016 (expected) on official website. SSC CHSL 2015 Re-exam Result to be Declared on 10th August 2016: Two exam centre’s candidates of Kota Centre (Venue No.31) on the evening session and Ajmer Centre (Venue No. 50) on the morning session of 01st November 2015 will be re-scheduled on 6th August 2016. The Admit card for this re-exam has been uploaded on official website of the Northern Region of the Commission’s website. The SSC CHSL Result 2015-16 of this re-exam will be declared on 10th August 2016. SSC CHSL Result 2015-16 Cut Off Marks: The result has been announced and candidates have been shortlisted on the basis of cut off marks obtained by the candidates in each category. 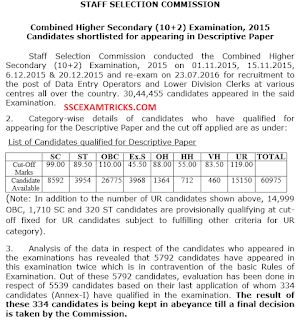 List of Candidates qualified for Descriptive Paper. Those candidates who had attended and now waiting for their SSC CHSL result; they can download it from direct link given here. 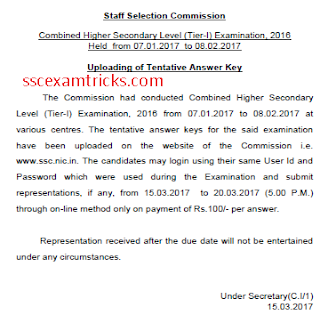 SSC CHSL 2015 Answer Keys Available on 23rd May 2016: The big news is that SSC CHSL 2015 (10+2) answer keys have been uploaded on 23.05.2016 at ssc.nic.in. Formerly SSC CHSL (10+2) level exam was organized on 01st, 11th & 15th November and 06th & 20th December 2015 at many exam centres. The official answer keys have become available to measure the performance of the successfully appeared candidates. Any objection in answer keys can be sent by 31st May 2016 at 05:00 PM on official website. Those candidates who had appeared in SSC CHSL 2015 exam, they can download official answer keys of all sets from direct link given here. “For the information of the candidates, the tentative timeline for the declaration of results for various examinations conducted by the Staff Selection Commission is given in the Table below. These dates are tentative and every effort will be made by the Commission to try to further compress the time for the declaration of the results of the following examinations”. SSC CHSL Result 2016 LDC (10+2 Level) Scorecard (29.03.2016): As per resources, the latest news is that SSC has all set to declare CHSL Result, scorecard & cut off marks for LDC DEO (10+2) level posts and it can be uploaded any time with in few days (possibility 1-2 days) on the official website. So you are all advised to keep visit official website regularly to check latest updates or you can be intimated via this page immediately as it gets announced by commission through provided direct links of SSC CHSL Result 2016 here. Keep connected and get updated. The latest news is that SSC is likely to declare CHSL Result and LDC DEO SA PA marks list in 04th week of March 2016 or April 2016 for written exam which was conducted in November and December 2015 for all regions i.e. North region (NR), Central region (CR), North East region (NER) and South Region (SR). Those candidates who had attended written exam; they can download SSC CHSL Result 2016 Candidates can download their online hall tickets for examination from direct link given here. This page provides latest information about SSC CHSL Result and cut off marks (expected and actual) of each category for all regions. The written exam has successfully held on 01, 15, 22 November 2015 and 06, 20 December 2016. SSC CHSL Exam was provided in two languages; English & Hindi. This exam was an objective type and MCQ paper was delivered in four sets i.e. set A, set B, set C & set D. The exam syllabus was based on 12th standard (10+2 Level). The 200 questions of 200 marks were asked from English Language (Basic Knowledge), General Intelligence & Reasoning, Quantitative Aptitude, General Awareness / Current Affairs. The time duration of exam was 160 minutes. The breaking news is that unofficial answer keys of SSC CHSL DEO Exam 2015 has been available and can also be downloaded here. Earlier SSC CHSL notification was available in June 2015 and a huge numbers of applications had applied by SSC LDC online process provided. Then SSC CHSL exam was organized and finally SSC CHSL exam result has been announced. 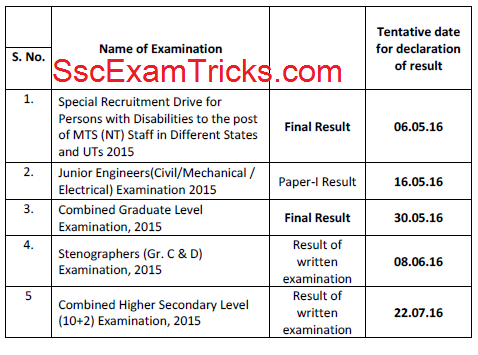 SSC CHSL Cut off Marks 2015-16: Based on the exam analysis, measuring difficulty level of exam, evaluating response of candidates, reporting expert views and 2014 2013 Years cut off marks, the expected cut off are discussed here. Expert’s View: Do first GK, then reasoning, English, QA. Finally, we have been well aware about the written exam under SSC CHSL Recruitment 2015-16 and now, we know that you are very curious to know the process to download SSC CHSL Result 2015-16. You don’t worry SSC CHSL DEO Result 2016 will be uploaded in PDF file with a list of shortlisted candidates to be invited to attend typing test and skill test of the candidate. Click on that direct link and download your SSC CHSL Result will be downloaded. Besides that, you can check SSC CHSL Typing Test / Skill Test Scheduled, SSC CHSL Result for LDC DEO PA SA Typing / Skill Test etc. To know the scorecard/ marks obtained in the exam held in November/ December 2016, you must login your account registered on the official website ssc.nic.in. The direct links are provided here. Direct Link to download SSC CHSL Final Result 2016 based on objective exam held on 01st, 15th, 22nd November and 6th, 20th December 2015 and Descriptive exam held in September 2016 followed by typing test of the candidates.